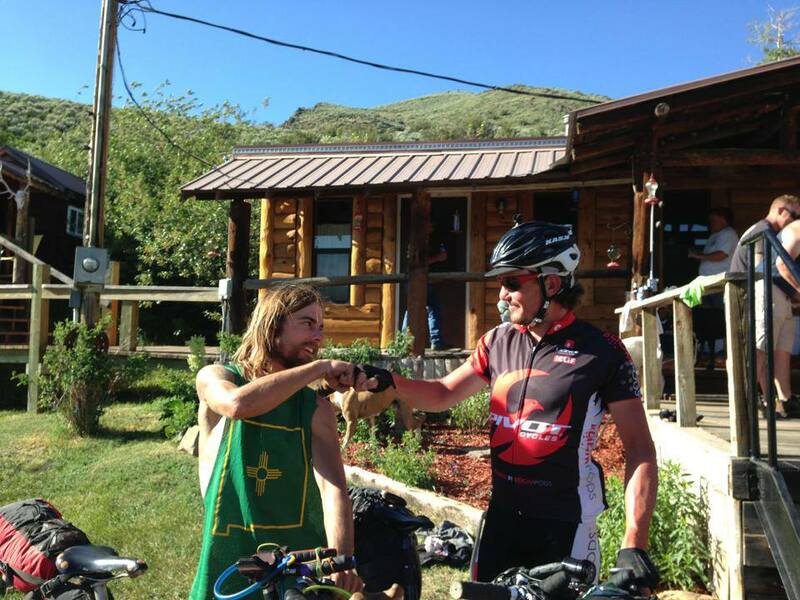 Northbound and Southbound leaders Cjell Money and Mike Hall connected at Brush Mountain Lodge in Slater, Colorado, during the 2013 Tour Divide. Photo posted by Brush Mountain Lodge. 1. Mike Hall’s Tour Divide: Round-the-World record-breaking cyclist Mike Hall finished the 2013 Tour Divide in the fastest time yet, but missed out on an official record because he had to take two diversions around forest fires in New Mexico. Still, he kept an incredibly strong and persistent pace throughout the race, even after his closest competition, Craig Stappler, dropped. Hall finished the 2,745-mile mountain bike ride in 14 days, 11 hours and 55 minutes, more than a day faster than previous record of 15 days, 16 hours, 14 minutes set by Jay Petervary in September 2012. 2. Jay Petervary’s Iditarod Trail Invitational: Cycling conditions on the Iditarod Trail have never been better in the history of the human-powered race to McGrath than they were in 2013, but that doesn’t diminish the impressiveness of Jay Petervary shaving a half day off the prior record in the 350-mile race with several strong cyclists giving chase. Petervary hammered the last stretch of trail between Nikolai and McGrath to hold off Tim Bernston by 34 minutes and Jeff Oatley of Fairbanks by 51 minutes. Petervary’s new course record was 2 days, 19 hours and 16 minutes. 3. Jefe Branham’s Colorado Trail Race: Branham continued to dominate the CTR, holding off Jesse Jakomait to take his third title after covering the course in four days, 14 hours and four minutes, on less than four hours of sleep. Branham first won the race in 2007, took third in 2009 and 2010 riding a singlespeed, and returned with gears to finish first and break the course record in 2012. This year, the group opted to ride “backward” on the course from Durango to Denver, including a reroute that added approximately 50 more miles to the race. 4. Kurt Refsnider’s Arizona Trail Race: Refsnider headed out for an individual time trial of the 300-mile course in the spring, lowering the course record to 2 days, 2 hours, and 20 minutes after Aaron Gulley won the Arizona Trail Race and lowered the course record just one week earlier. 5. Billy Rice’s Tour Divide out-and-back: Rice became the first known rider to complete a 5,500-mile mountain bike ride along the Continental Divide from Mexico to Banff and back in one go. His official completion of the Great Divide Mountain Bike Route was 22 days, 18 hours, and 41 minutes for the northbound ride, and 20 days and 13 hours for the southbound return, for a total time of 44 days and 42 minutes. 6. Forest Baker’s Triple Crown: California bikepacker Forest Baker established the fastest time this year for the completion of all three major North American bikepacking races — the 750-mile Arizona Trail Race, the Tour Divide, and the Colorado Trail Race — in a single season. (Kurt Sandiforth holds the Triple Crown record, set in 2012.) However, on top of the big three, Baker also completed the Stagecoach 400 and stopped short of also finishing the inaugural ride of the California Sierra Trail Race due to injury. 7. Billy Koitzsch’s Iditarod/Iron Dog: Koitzsch became the first person to ride a bicycle the full length of the Iditarod Trail and then turn around and return to Fairbanks on the Iron Dog route, a 2,000-mile ride across Alaska and back in a single season. Spring beat him to Fairbanks, and he was forced to ride final 160 miles on pavement due to the trail turning to slush. Still, it was a boundary-pushing ride for fat bikes, and for human-powered winter travel. 1. Eszter Horanyi’s Iditarod: Horanyi, who holds nearly every major record in North American bikepacking, shaved six hours off the women’s record in 2013 Iditarod Trail Invitational in 3 days, 16 hours, and 20 minutes, finishing 10th overall in her rookie year. 2. Eszter Horanyi’s Arizona Trail Race: Just a month after wrapping up her cold ride across Alaska, Horanyi put in a near-perfect race in the Arizona desert. She slept minimally, made no mistakes, and rode steady throughout to take 15 hours off the record in two days, 13 hours, and 15 minutes during her rookie run. It was an incredibly strong early season for Horanyi that was unfortunately disrupted by illness later in the year. 3. Rebecca Rusch’s Kokopelli: Although not technically bikepacking, the Kokopelli Trail, which runs 142 miles from Moab, Utah, to Fruita, Colorado, is a popular self-supported time-trial goal for mountain bikers. Despite crashing, dislocating her finger, and riding without lights for a portion of the night, Rusch completed the course in 13:32:46, besting the previous female record of 15:03 set by Lynda Wallenfels in 2006. 4. 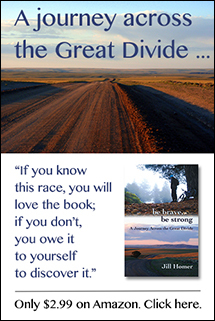 Jeannie Dreyer’s Freedom Challenge: Riding with her husband, 2012 winner and record holder, Martin Dreyer, Jeannie Dreyer shattered the women’s course record in the race across South Africa in 12 days, 5 hours, and 55 minutes. The former women’s record was 19 days 07 hours and 55 minutes, set in 2011 by Tatum Prins. Hey you guys ought to check out Sanjay’s adventures. He’s been Bikepacking through India and Nepal for the last 6 months. He just renued his visa for another 6 months. Last year he hiked the PCT in a month less time than anyone else that year. Thanks Jill. Great info and amazing accomplishmtns. Agree w/ Michael…Billy Rice for the guys, and Jeannie Dryer for the ladies (though in all honesty, it’s a hard decision for either, as all the performances leave me speechless).